We had a nice day in Istanbul. Sightseeing included the Blue Mosque, the Hagai Sophia, Topkapi Palace, and the Archaeological Museum. We toped off the day with a cruise on the Bosphorus. This is the strategic waterway that connects Russia (and the countries that were formerly part of the USSR) and the Mediterranean and the rest western world. After I review my photos I will try to upload an additional one or two for your enjoyment. Below is something I wrote a few days ago about Aslan. Read and enjoy. Everyone familiar with the Chronicles of Narnia remember that Aslan is the name of the lion. Note this paragraph about Aslan from Wikipedia. Aslan is a word meaning lion. Lewis came up with the name during a trip to the Ottoman Empire, where he was impressed with the Sultan’s elite guards also called Aslan because of their bravery and loyalty. I noticed a restaurant in Istanbul with the name Aslan. You may also recall that Edmund was tempted by Turkish delight. It is good stuff. The Disney movie, Prince Caspian, opens May 15. The official website is here. Check our page about C. S. Lewis here. Many of you probably saw the Today Show this morning. This is the week for Matt Lauer’s “Where in the world…” series. We have always enjoyed these programs because they remind us of so many places we have visited on our tours. This morning Matt was in Istanbul, Turkey. We will be heading there in a few days to begin our Steps of Paul and John tour. There were a few scenes from other places in Turkey, including Ephesus and Cappadocia. We visited Cappadocia last summer on our Ancient Crossroads tour of historical and biblical Turkey. Here is a photo I made during a hot air balloon over the mysterious landscape of Cappadocia. Note the cultivated vineyards in the foreground below our balloon. 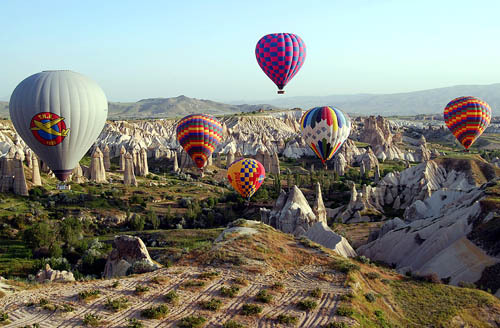 Two of the New Testament epistles were addressed to saints living in Cappadocia. Peter, an apostle of Jesus Christ, To those who reside as aliens, scattered throughout Pontus, Galatia, Cappadocia, Asia, and Bithynia, who are chosen. (1 Peter 1:1). All of the places mentioned in 1 Peter 1:1 are located in modern Turkey. It is a fascinating place to visit.